I’ve found this post really hard to write. Its been in my drafts folder for at least a year. I’m not sure I’ve been able to describe what I’m trying to say. Its kind of a chicken and egg tale. Initially I’d thought this was about not knowing if my lifestyle led to minimlism, or if my adventure with minimalism had led me to a certain lifestyle. There had always been an emotional attachement to this entry. Having created a number of drafts and structured it so I understand, this is not a tale about clearing up clutter, its a tale about clearing up life, my life. I’ll take you back a few years ago. The executive house I lived in was up for sale. I won’t talk about the reasons why, but when we move we have to go through the usual process of sorting through years of stuff that accumulate. Rather than just box up everything I thought I’d take the opportunity to throw out a few things that were obsolete, broken or I just didn’t want anymore. I remember this day particularly, the sun was out, it wasn’t raining and for one reason or another all of these things conspired to tell me that the garage was my intended space for deculuttering that day. The thing is, when I got started, I didn’t just pick out the odd thing here and there, the obvious candidates for recylcling, or repurposing. I wanted to throw away everything, and I mean, everything. By the time I was done, there was little left, the garage a barren space, unrecognisable, and I was in a state of euphoria. That was the time when it hit me. I was euphoric having spent hours removing the clutter from my life, a job well done. But there was something else, something far deeper, I was euphoric about what this meant. I had not only created physical space, I had created a mental space to go along with it. Space for now, space for the future and space for a new life. My life in the new style I was about to create ? The house didn’t sell as it happened. Well, not for a while, a good while, but that didn’t stop me getting rid of more and more stuff and clearing more space. Was I just tidying things up, or clearing a space for my future ? In hindsight, and to this day I’m not completely sure what happened that day, It was a milestone, I think I saw the glimmer of this new lifestyle. Maybe I’d just been reading too many blogs*, but Minimalism was some sort of means to get there. By getting rid of this stuff, then perhaps cleaning my mental clutter at the same time. I could find this space, this empty place that would allow me to think about the next steps. De-cluttering allowed me to create a space and think clearly and with purpose. It was a means to create space to do bigger and better things. Even today, I find I have to clear surfaces and put things away, create an uncluttered space, before I take on a sizeable work task. So I think Minimalism for me, is an enabler. It enables me to focus on whats important. I still love clean spaces, the clutterless rooms, but more than that, the space allows me to rest and revitalise my mind. Ready for greater things. I’m not sure why telling this story was so hard. Minimalism was an enabler for the lifestyle I now live. Its an awesome lifestyle I should point out. I live the dream as my daughter constantly tells me. I think the emotional attachment was with what came next. Free of clutter and with space in my mind, I started to make changes. I knew with some amazing clarity what I wanted, and equally what I didn’t want from my life. In hindsight I made some very big decisions, looking back painful and upsetting ones. But, I made them, and knew exactly what I was doing, and, in hindsight, they were the best decisions for everyone. Minimalism allowed me to find the space to make choices that changed my life. * Zen Habits and The Minimalists. 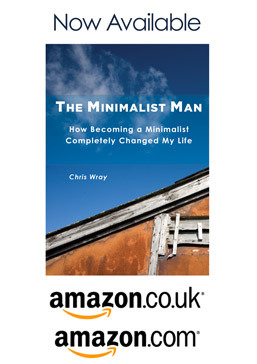 For me, minimalism was the first step in some major lifestyle changes… many of which are still in progress. Now that I’m not throwing away money on material goods, I can afford to travel. Well, it took you a long time to write it, but it was a really good post. I know what you mean. I have been finding that I feel lighter and lighter every time I get rid of something else. And I think it’s because of what you were saying – that it’s giving me more and more room for my new life. You sound content now. I’m very happy for you.